Please see Additional file 1 for translation of the abstract in the five official working languages of the United Nations. Epilepsy is highly prevalent in onchocerciasis-endemic regions, particularly in areas where the intensity of infection is high [1–3]. The relationship between onchocerciasis and epilepsy has further been underlined by two meta-analyses [4, 5] as well as recent community-based surveys in rural onchocerciasis-endemic villages, where 3.5–7.8% of the population have epilepsy [6–9]. Although onchocerciasis is classically known to only cause skin and eye disease, there is accumulating evidence suggesting that Onchocerca volvulus (the parasite that causes onchocerciasis), may directly or indirectly, be causing a wide spectrum of seizure disorders now described as onchocerciasis-associated epilepsy (OAE) [10, 11] (Fig. 1). Indeed, childhood infection with O. volvulus was shown to augment the risk of epilepsy in a microfilaria load-dependent manner . In addition to generalized tonic-clonic seizures, absences and focal seizures, OAE also includes two clinical entities namely the nodding syndrome (involuntary, brief head nodding movements of sudden onset with reduced consciousness, possibly associated with declining cognitive function) and the Nakalanga syndrome (stunting, delayed or absent secondary sexual characteristics, deformities and/or epilepsy) [12–14]. An estimated 381 000 individuals currently suffer from OAE ; however the exact pathophysiological mechanism by which onchocerciasis may cause epilepsy is yet to be determined and treatment of affected persons remains sub-optimal. Nearly 80% of persons with epilepsy (PWE) live in low- and middle-income countries  including sub-Saharan Africa, which also harbours more than 99% of cases of onchocerciasis [17, 18]. The epilepsy treatment gap in these regions is wide, with an estimated 75% of PWE not receiving adequate treatment . This results in frequent epilepsy-related morbidity including a high burden of uncontrolled seizures, burns, traumatic injury and drowning . Also, the epileptic seizures and the itching of onchodermatitis result in stigmatization of the affected individuals [19–21] thus increasing the psycho-social burden of OAE. Consequently, many PWE remain hidden from the public and undetected by healthcare services , leading to late diagnosis of the condition and frequent complications. Mortality amongst PWE living in onchocerciasis-endemic areas is 6.2 to 7.2 times higher than in the general population [23, 24], compared to only 2.6 times in non-endemic settings . As the peak ages of onset of OAE lie between 3 and 18 years , many untreated youngsters suffer from recurrent seizures and progressive neurological deterioration, with negative socio-economic repercussions. Moreover, the affected younger generation becomes an additional care burden, being unable to cater for the older generation. Such a huge epilepsy burden necessitates an intervention tailored to meet the specific needs of these communities. The goal of this paper is to address the medical, psycho-social and economic burden faced by PWE and their families. We performed a selective search on PubMed for relevant articles focusing on epilepsy management in resource-limited settings, including onchocerciasis-endemic areas. We also took into account recommendations from the World Health Organization (WHO)  and conclusions emerging from multidisciplinary working group discussions during the first international workshop on OAE . In remote onchocerciasis-endemic villages in Africa, access to healthcare and anti-epileptic drugs (AED) is generally difficult . PWE have to walk for long distances to the health facility, only to be received by personnel not trained in epilepsy care . Moreover, the health facilities seldom have AED in stock and even when they do, finances still constitute a major limitation to PWE receiving treatment . Most often, there is no clear epilepsy management plan in these areas, and PWE must strive to obtain AED all by themselves. In the absence of community and political engagement in epilepsy care in these villages, many PWE and their families resort to traditional healers , thus further delaying medical treatment while the symptoms worsen . The current strategy for epilepsy management fails to detect PWE in the community, does not narrow the treatment gap and produces poor health outcomes for PWE. During our recent surveys in onchocerciasis-endemic villages [6–9], we noted some common factors which must be considered before designing an epilepsy intervention. These include: remoteness of the onchocerciasis-endemic villages, poor accessibility, general poverty, inadequate healthcare services (little or no health infrastructure and/or personnel, frequent medication shortages), high epilepsy prevalence, poor health seeking behaviour leading to late diagnosis and frequent complications (cognitive symptoms, psychiatric problems, burns, trauma due to falls, submersion injuries), low literacy rate with frequent school drop outs at the primary level, frequent sexual abuse, misconceptions and stigma [11, 19, 30]. It is expedient that PWE in onchocerciasis-endemic areas receive appropriate treatment and that new cases of OAE be prevented by strengthening onchocerciasis elimination in endemic areas [11, 14]. Epilepsy is a condition that necessitates a chronic disease management plan that is both comprehensive and sustainable. We propose a framework for decentralization of care to local epilepsy clinics with task shifting from neurologists to basic health personnel and community health workers. The use of community volunteers for epilepsy care has been shown to be feasible and cost-effective in sub-Saharan Africa  including onchocerciasis-endemic settings . Procedures for epilepsy diagnosis and management must be simplified for easy application by non-physicians (nurses and clinical officers), with zonal supervision by physicians. A network of specialists should be readily available by telephone for advice or for referral of complex cases. The different aspects of a comprehensive community-based epilepsy program are discussed below (see Additional file 2). We propose to use the following definition of epilepsy: “the occurrence of at least two unprovoked seizures separated by at least 24 hours” . The term “unprovoked” means that common causes of acute seizure such as febrile illness, infection of the central nervous system and substance abuse are not incriminated. Of the numerous tools that have been developed for epilepsy screening [34–37], the most suitable for use by basic health personnel/community workers is the 5-questions format developed by the Institute of Neurological Epidemiology and Tropical Neurology of Limoges (France) . This tool was specifically elaborated for Africa with the support of the Pan-African Association of Neurological Sciences and the International League Against Epilepsy (Commission on Tropical Diseases, 1993–1997). It has the advantages of being brief, usable by non-physicians and showed a high sensitivity of 95.1% as well as an acceptable specificity of 65.6% during its validation in Mauritania . It is also effective in diagnosing seizure types other than generalized tonic-clonic episodes, such as absences and focal seizures. However, because of the low literacy levels in resource-poor settings, the questions need to be asked in ways the local population will easily understand (Table 1). The questions should be translated in the local languages and back-translated for validation prior to use, and those who will administer the tool must be trained to properly understand how to ask the questions. 1. Loss of consciousness and/or micturition and/or drooling? Does the person suddenly fall for a short period of time (few seconds to minutes)? During such falls, is there saliva (foam) on the mouth and/or urine on the victim? - Sudden fall implies that the victim has no time to hold onto a support before falling. - Micturition and drooling are usually absent during syncope, dizziness or hysteria but typically present during generalized tonic-clonic seizures. 2. Absences or sudden lapse of consciousness for a short duration? Does the person suddenly stop talking/eating/working for a short period of time (few seconds), and does not respond when you call him/her? After that, does she/he resume to what she/he was doing? - Questions must relate to common activities such as farming, talking and eating because it is the easiest way to notice abnormal events. - If the PWE cannot recall the episodes of brief lapse of consciousness meanwhile it is reported by the caretakers, it is most likely an absence. 3. Jerky or uncontrolled movements of one or more limbs (convulsions), of sudden onset and lasting for a few minutes? Does the person get sudden shaking of the whole body or just part of the body (hands, legs) and this then calms down after a short while? Generalized tonic-clonic seizures are easily recognized and may have a local appellation. It could be helpful to ask the interviewee to mimic the abnormal movements. Ask also whether the person experiences isolated movements of the head (nodding seizures). Importantly, do not suggest answers. 4. Sudden onset of brief body sensations, hallucinations or illusions be they visual, auditory or olfactory? While fully awake, does the person often complain of abnormal body sensations, or seeing/ hearing/ smelling things that are not really there for a short period (few seconds to minutes)? Non-motor seizures are difficult to explain. The best approach is to create a scenario of visual or auditory hallucinations (seeing people who are not present, hearing voices). In some cases, the symptom is well known but had never been attributed to epilepsy. Use the local word for hallucinations when screening, if it exists. 5. Had it been said before that the subject had epilepsy or had presented epileptic seizures? Ask the question using the local word for persons with epilepsy in that community. Most families will readily answer this question. However, more tact is needed to pull out cases that are generally hidden by the family because of associated stigma . In case of a positive response to any of the 5 screening questions, the second step should be to refer the person to a trained nurse or clinical officer to confirm or reject the diagnosis of epilepsy using another questionnaire (Additional file 3, Appendix 1). This confirmatory questionnaire could be printed on paper or developed as a mobile telephone application  to ease information exchange with specialized health personnel in case the diagnosis needs to be further discussed. 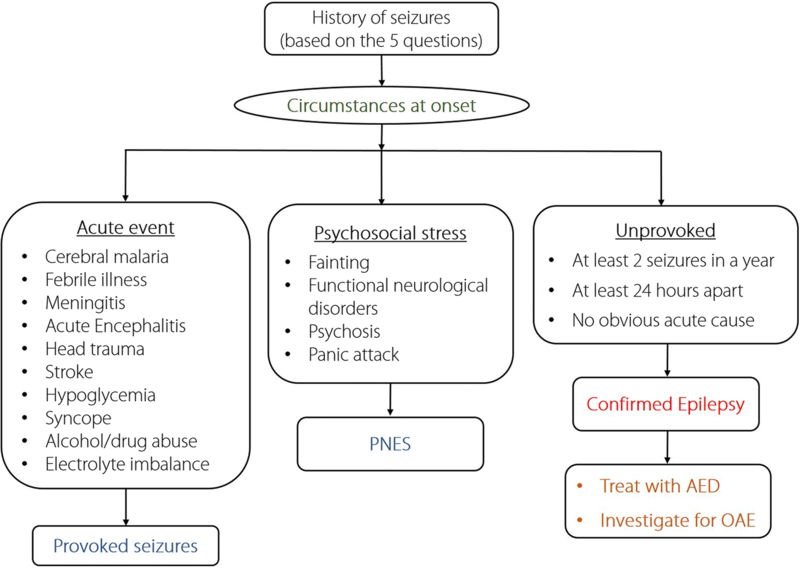 In confirmed PWE, the likelihood of OAE in the community can further be investigated using the following criteria : (i) History of at least two unprovoked epileptic seizures 24 h apart; (ii) Person living for at least three years in an onchocerciasis-endemic region; (iii) A high prevalence of epilepsy in the village and families having more than one child with epilepsy; (iv) No other obvious cause for the epilepsy (mainly by good history taking to exclude common etiologies such as perinatal, infectious or traumatic causes); (v) Onset of epilepsy between the ages of 3 and 18 years; (vi) Normal psycho-motor development before the onset of epilepsy. Local health personnel working in onchocerciasis-endemic settings are encouraged to check for exposure to O. volvulus in PWE either clinically (presence of characteristic skin lesions such as leopard skin, onchodermatitis and/or nodules) and/or biologically (skin snips, Ov16 antibody testing using rapid diagnostic tests). It is important to train the local health personnel on how to distinguish epilepsy from the following differential diagnoses: acute seizures (due to fever or an ongoing intracranial insult) , temporary loss of awareness (due to syncope or transient ischaemic attack), focal brain lesions (due to an abscess, hematoma or ischaemia), and psychiatric disorders including psychogenic non-epileptic seizures (PNES)  (Fig. 2). The training should be done by neurologists and/or physicians with specialized expertise in epilepsy management, who would continue to have a supervisory role in the management program . Epileptic seizures are treated using anti-epileptic drugs (AED) but only a limited number of AED are available and/or affordable in low resource settings . AED that are routinely used in onchocerciasis-endemic regions include phenobarbital, carbamazepine, phenytoin, and valproate [7, 28, 32]. Their indications and prescribed dosages as recommended by the WHO  are detailed in Table 2. AED treatment must be initiated as monotherapy with progressive dose increase based on the response to the treatment and seizure control. Phenobarbital, the most available and affordable AED (annual cost per PWE: USD 5 ), is used as first line treatment for most seizure types but is not recommended for absences. It is usually initiated at 2–3 mg/kg/day and could be increased every 2–3 weeks by 15 mg if seizures continue, without going above the maximal recommended dose. When switching to another AED, phenobarbital should be tapered progressively (15 mg reduction every two weeks) while starting the newly prescribed AED as soon as the tapering begins. This approach minimizes the risk of rebound seizures upon stopping phenobarbital . To ease administration of the right drug dosage, both phenobarbital 30 mg and 100 mg should be available. Switching to another drug is indicated if there is no decrease in seizure frequency using the right dosage of AED and/or when there are unacceptable side effects . Polytherapy must be discussed with a specialist if two different drugs have failed . Importantly, PWE must be educated that good seizure control can only be achieved by consistently taking AED every day and not just after a seizure. Recommended by WHO as first line AED for most seizure types, except absences; cheap and readily available [19, 26]. Used by 74.6% of PWE . For PWE taking antiretroviral drugs (ARV), valproate is preferred as it presents less interactions with ARV . There is a risk of foetal malformations with all the above mentioned AED, particularly during the first three months of gestation. If AED treatment is absolutely required during pregnancy, carbamazepine could be considered at the minimal effective dose, because it has the least risk of malformations and seems to have no negative effect on the neurodevelopment of the child later in life [45, 46]. Several studies have clearly demonstrated the teratogenicity of valproate and it should therefore be avoided in women of childbearing age and during pregnancy . Moreover, unplanned pregnancies in female PWE should be discouraged and may be prevented by providing contraception. Barrier methods (condoms in particular) are most feasible as they are cheap, available and unaffected by AED unlike hormonal methods . Supplementation with folic acid (4 mg/day) before and throughout pregnancy is encouraged as this reduces the risk of neural tube defects . For public health reasons and also as a specific treatment measure, PWE residing in onchocerciasis-endemic areas should receive ivermectin at least once a year  at the recommended dosage of 150 μg/kg alongside all other inhabitants of the endemic villages. Ivermectin is however mostly active against the microfilaria or larva, but exhibits only a partial effect on the adult O. volvulus or macrofilaria after repeated consecutive doses . The once or twice annual treatment with ivermectin is needed for 15 years or more to achieve elimination . Although current guidelines exclude pregnant women and children under five years from receiving ivermectin, we recommend that the safety of ivermectin should be investigated in children under five years  because the accumulation O. volvulus microfilaria in the absence of treatment increases the risk for OAE . In persons with NS and Nakalanga syndrome, nutritional rehabilitation and additional specific measures may be required . PWE are at risk of seizure-related injuries and have more frequent accidents even without a seizure . Common complications directly related to seizures include burns, traumatic lesions and submersion injuries. The ILAE has proposed guidelines to prevent seizure-related injury particularly in children ; these include close monitoring during bathing, sports, or when using open fires or the oven. Applying these guidelines in onchocerciasis-endemic settings would imply that PWE should not go to the well or river alone, nor go to the farm or sit near open cooking places without surveillance. Fire stoves should be made more secure and elevated to avoid PWE falling into them during a seizure. Furthermore, the bed of PWE should be as low as possible to prevent falls from a great height during a night seizure. Rooms of PWE should be void of unnecessary furniture and sharp objects which could hurt the PWE in the event of a seizure. Burn injuries should urgently be cooled with clean running water for about 20 min, and then the victim should be rushed to a health facility. The health personnel should perform thorough debridement and adequately dress the wound. Local antiseptics could be applied. Tetanus immunization associated with serotherapy, and empirical antibiotic treatment should be given. As for submerged (drowning) PWE, they should rapidly be rescued from water and given cardiopulmonary resuscitation as required: repeated cycles of 30 chest compressions and two rounds of mouth-to-mouth ventilation . Upon transportation to the health facility, they should be half-seated and any asthma-like breathing difficulties as a result of reflex bronchospasm can be relieved symptomatically using inhaled salbutamol . Some epilepsy-related complications such as severe burns, severe traumatic injury, cognitive disabilities and psychiatric problems would require consultation with specialists via the telephone or having visiting specialists on a regular basis. If none of these is possible, there would be need for referral to a more specialised health facility. Treatment for PWE should be dispensed through epilepsy clinics established at primary health care facilities, which should serve as the focal points to ensure epilepsy care and AED delivery. A senior nurse/clinical officer at the health facility should be trained to head the clinic; his/her duties will be to consult suspected cases of epilepsy, confirm the diagnosis, prescribe AED, evaluate for adverse effects and treatment outcomes and notify doctors/specialists in case of treatment failure, side-effects or complications. Nurses from target zones can be collectively trained during periodic seminars supervised by competent specialists and should be given practical manuals to ease implementation. Physicians trained in epilepsy care and/or specialized doctors working in nearby health structures are encouraged to regularly visit the clinics to personally consult some PWE and offer field supervision to the clinic heads. Another task for the head of the clinic is to ensure the continuous supply of AED by ordering them every month based on the needs. Given the low purchasing power of the affected population, we propose a participatory approach for AED purchase whereby the affected families pay a yearly token (USD 2–USD 3 per PWE per year) which will be complemented by the government, local authority, or a partner organization to ensure an uninterrupted supply of AED all year round. This will have the double advantage of ensuring sustainability and increasing treatment adherence by PWE as they seek to fully utilize their invested funds. Epilepsy clinics should negotiate directly with accredited AED suppliers to deliver the drugs on site. These AED suppliers could benefit from certain privileges (such as tax reduction or exemption) to ensure continuous availability of routinely used AED at affordable costs. Valproate is much more expensive than the other AED, and should be subsidized to encourage treatment adherence. Indeed, we have observed that certain PWE switch from one AED to another or may stop treatment because the drugs are too expensive. Epilepsy clinics should equally provide psycho-social support to PWE and their families. This can be achieved via support group sessions with patient-carer associations, during which advice and tips are given to PWE to equip them for healthier and more autonomous lives. Practical issues to be discussed include: treatment adherence, balanced diet, sufficient sleep (≥ 7 h per day), avoiding substance/alcohol abuse, physical exercise such as jogging, and school/work resumption. PWE should be encouraged to share their success stories so as to encourage others. CHW constitute the support staff and community arm of the epilepsy clinic. The clinic head should train them to suspect epilepsy using the 5-question approach and refer suspected PWE to the clinic for confirmation. As such, they will be instrumental in community-based surveillance of epilepsy by tracking suspected cases within their communities and referring them to the clinic for early diagnosis. Early diagnosis allows for epilepsy care to be initiated before the onset of complications. Also, a community-based surveillance system provides more realistic estimates of the burden of epilepsy, which is usually underestimated in hospital settings. It has been suggested that instead of CHW, community-directed distributors of ivermectin (CDD) could be trained for epilepsy screening, follow-up and surveillance in onchocerciasis-endemic areas . CHW equally have to ensure community follow-up of PWE via home visits, ensuring good treatment adherence, monitoring treatment outcomes and reminding families of the monthly follow-up visits. They should monitor seizure frequencies of PWE and report in monthly forms (see Additional file 3, Appendix 3). For remote communities, CHW could collect AED from the clinic and deliver to the PWE in the village once a month. In addition, they are in charge of educating their respective communities about epilepsy in order to reduce stigma towards PWE. Some financial incentive may be required to boost the activities of CHW. Traditional healers are highly sought after by affected families and should not be neglected when setting up an epilepsy management framework [19, 42]. Studies in Cameroon showed a willingness of traditional healers to collaborate with health professionals in epilepsy management . Therefore, their role in the comprehensive management plan should be well defined ; after receiving basic education on epilepsy, they would be expected to educate families who bring PWE to them and refer suspected cases to the clinic. A modest compensation per PWE referred to the clinic and per family counselled could motivate traditional healers to actively participate in the management program. Once the involuntary movements cease, put the person to lie on his/her side (recovery position) to prevent aspiration; check airway, breathing and pulse. A person with a prolonged seizure or short recurrent seizures within the same day should urgently be taken to the health centre. Outreach programs need to be organized in the community, schools, churches, markets and other public gatherings to sensitize the population about epilepsy. In onchocerciasis-endemic villages, clustering of PWE within some households fosters the wrong belief that epilepsy is transmissible by touch . Primary care givers and the general public should be educated on the non-contagious nature of epilepsy and its non-mystical origin. Proper community education about epilepsy and the possible role of onchocerciasis in the clustering of PWE in some households will reduce epilepsy-related stigma and increase treatment adherence . Epilepsy may affect education and other lifetime opportunities, income, social and professional fulfilment especially in low-income countries . Younger PWE should be encouraged and assisted to go back to school (as most of them drop out at the onset of seizures). Parents and teachers should be informed that epilepsy does not necessarily render the PWE inept for schooling. Attractive policies such as free tuition, scholarships or other opportunities for PWE could galvanize them to effectively resume school. Furthermore, teachers should be trained on how to cater for the special needs of PWE who often have learning difficulties due to cognitive impairment . This will entail adapting the academic curriculum for slow learners, exercising patience when teaching PWE, and training teachers to intervene efficiently in the event of a seizure. For the older PWE or those who cannot resume formal education for some reason, periodic capacity building training sessions should be organized to empower them with certain skills in agriculture, craftsmanship or other lucrative activities. More importantly, a sure market should be provided for their goods and services in order to sustain this strategy. This can best be achieved within the framework of patient-carer associations that PWE and their families are encouraged to form, to serve as support action and advocacy groups. There is strong epidemiological evidence suggesting an association between epilepsy and onchocerciasis, with increasing onchocerciasis transmission resulting in increased epilepsy prevalence [3, 4, 10]. Therefore, strengthening onchocerciasis elimination programs is important to decrease the incidence of epilepsy . In addition to frequent sensitization of the population in general and PWE in particular about the importance of taking ivermectin, advocacy is needed in favour of biannual ivermectin distribution in endemic communities. Where transmission remains very high, alternative treatment strategies such as river larviciding should be considered . Similar interventions may have been partly or mainly associated with the prevention new cases of nodding syndrome in Uganda . To develop a sustainable comprehensive management program for PWE, a participative approach including integration into the national health system, must be established from the very start. A clear vision needs to be communicated to community leaders, elites, authorities, existing patient and advocacy associations to make them buy into the project early enough so as to participate in its implementation. Regular and concise reporting will improve credibility and build enough impact for the program to ensure sustainability. The local population should be convinced to consider epilepsy care as a priority community intervention in which they will voluntarily participate. Various parties in the epilepsy program and their roles are shown in Fig. 3. Some practical constraints that may arise when implementing the community-based epilepsy program and proposed mitigation strategies are summarized in Table 3. Advocacy to prioritize onchocerciasis-endemic areas for AED delivery; work with multiple AED suppliers; advocacy with pharmaceutical firms to provide free/subsidized AED in endemic areas. Institute regular mobile clinics during which the nurse reaches out to remote communities. Can be coupled with other public health activities such as immunization, and maternal & child health services. AED could be transported monthly from the clinic to the village by the CHW. Epilepsy-related events not reported in some health systems. Advocacy to stakeholders about the importance of onchocerciasis elimination; make use of unpaid village volunteers for CDTI. Knowledge gaps still exist in the domain of prevention and management of epilepsy in onchocerciasis-endemic regions. Performing research in these regions however is difficult because of their remoteness, the lack of medical and research infrastructure, lack of trained healthcare workers and local researchers. A few research priorities that should be addressed to ameliorate epilepsy care in these regions are outlined in Table 4. What is the optimal screening tool to detect PWE by non-physicians? What is the risk of seizure recurrence in an O. volvulus-infected person after a first seizure? How can OAE be predicted or diagnosed in an early phase? What is the optimal training module for first line healthcare workers to care for PWE? What is the optimal anti-epileptic treatment for each type of OAE, including absences and nodding seizures? Is anti-onchocerciasis treatment able to reduce the frequency of seizures in persons with OAE? Is it safe to give ivermectin to children < 5 years with onchocerciasis and possibly OAE? 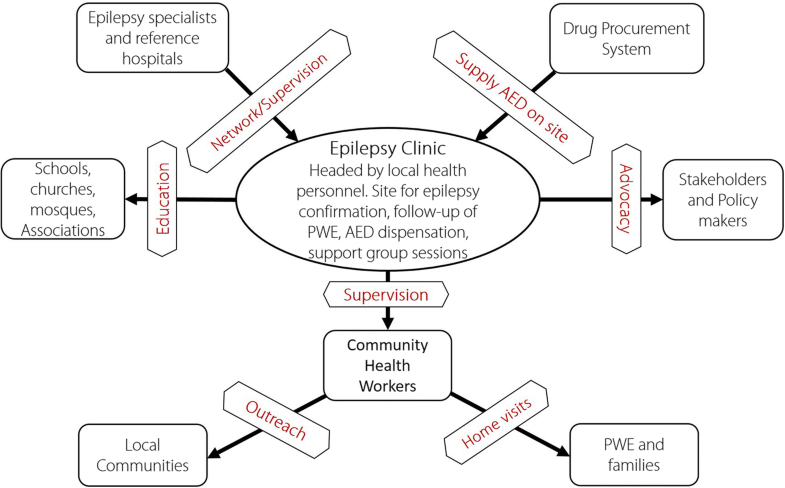 What is the impact and cost-effectiveness of a community-based epilepsy program? Epilepsy remains a major neglected public health problem in many onchocerciasis-endemic regions with sub-optimal control measures. Compared with HIV, another chronic stigmatizing condition, there is a large gap in treatment and care services available for PWE. In these regions, epilepsy stigma is further compounded by onchocerciasis stigma, thus limiting treatment-seeking behaviour. Establishing a comprehensive, decentralized community-based epilepsy treatment and care program that will equip non-physicians in the remote villages may be the way forward to improving epilepsy care. This requires proper advocacy and collaboration among many stakeholders – including pharmaceutical companies to provide cheap/free AED – and a strong political commitment for its implementation. Finally, onchocerciasis elimination programs should be reinforced to prevent future cases of OAE. We thank the numerous health care workers including CDD we were able to work with, and the families of persons with epilepsy we were able to interview in onchocerciasis-endemic regions. RC received funding from the European Research Council (grant No. ERCPoC 768815) and RI is funded by the Medical Research Council UK through a MRC/DFID African Research Leader Award (grant No. MR/M025489/1). JNSF wrote the first draft. All authors critically revised the initial draft, read and approved the final manuscript. Pion SD, Kaiser C, Boutros-Toni F, Cournil A, Taylor MM, Meredith SEO, et al. Epilepsy in onchocerciasis endemic areas: systematic review and meta-analysis of population-based surveys. PLoS Negl Trop Dis. 2009. https://doi.org/10.1371/journal.pntd.0000461. Mmbando BP, Suykerbuyk P, Mnacho M, Kakorozya A, Matuja W, Hendy A, et al. High prevalence of epilepsy in two rural onchocerciasis endemic villages in the Mahenge area, Tanzania, after 20 years of community directed treatment with ivermectin. Infect Dis Poverty. 2018. https://doi.org/10.1186/s40249-018-0450-3. Siewe FJN, Tatah GY, Tabah EN, Ngarka L, Nfor LN, Chokote SE, et al. Epidemiology of onchocerciasis-associated epilepsy in the Mbam and Sanaga river valleys of Cameroon: Impact of more than 13 years of ivermectin. Infect Dis Poverty. 2018. https://doi.org/10.1186/s40249%2D018%2D0497-1. Colebunders R, Abd-Elfarag G, Carter JY, Olore PC, Puok K, Menon S, et al. Clinical characteristics of onchocerciasis-associated epilepsy in villages in Maridi County, Republic of South Sudan. Seizure. 2018; Accessed 6 Oct 2018]; Available from: https://linkinghub.elsevier.com/retrieve/pii/S1059131118306204. World Health Organization. International Scientific meeting on Nodding Syndrome. Kampala, Uganda; 2012. Available from: https://www.who.int/neglected_diseases/diseases/Nodding_syndrom_Kampala_Report_2012.pdf?ua=1. Accessed 6 Mar 2018. Föger K, Gora-Stahlberg G, Sejvar J, Ovuga E, Jilek-Aall L, Schmutzhard E, et al. Nakalanga syndrome: clinical characteristics, potential causes, and its relationship with recently described nodding syndrome. PLoS Negl Trop Dis. 2017. https://doi.org/10.1371/journal.pntd.0005201. Vinkeles Melchers NVS, Mollenkopf S, Colebunders R, Edlinger M, Coffeng LE, Irani J, et al. 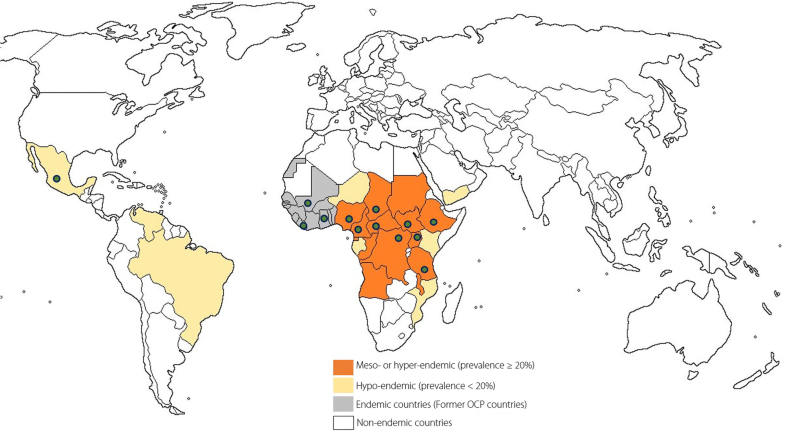 Burden of onchocerciasis-associated epilepsy: first estimates and research priorities. Infect Dis Poverty. 2018. https://doi.org/10.1186/s40249-018-0481-9. Wagner RG, Bottomley C, Ngugi AK, Ibinda F, Gómez-Olivé FX, Kahn K, et al. Incidence, remission and mortality of convulsive epilepsy in rural Northeast South Africa. PLoS One. 2015. https://doi.org/10.1371/journal.pone.0129097. Colebunders R, Mandro M, Njamnshi AK, Boussinesq M, Hotterbeekx A, Kamgno J, et al. Report of the first international workshop on onchocerciasis-associated epilepsy. Infect Dis Poverty. 2018. https://doi.org/10.1186/s40249-018-0400-0. Dongmo L, Echouffo TJB, Njamnshi A, Poyi MK, Victor S, Nourdi PM. Difficulties faced in the management of epilepsy in rural Cameroon: the case of Mbangassina locality. Afr J Neurol Sci. 2003; Accessed 27 Feb 2018]. Available from: http://www.ajol.info/index.php/ajns/article/view/7533. Ma TM, Ma TM, Lelo GM, Nkosi MM, Madinga J, Kola CK, et al. Are the children with epilepsy treated traditionally a disadvantaged group? A pilot study. Pan Afr Med J. 2016. https://doi.org/10.11604/pamj.2016.23.229.9165. Idro R, Namusoke H, Abbo C, Mutamba BB, Kakooza-Mwesige A, Opoka RO, et al. Patients with nodding syndrome in Uganda improve with symptomatic treatment: a cross-sectional study. BMJ Open. 2014. https://doi.org/10.1136/bmjopen-2014-006476. Ngugi AK, Bottomley C, Chengo E, Kombe MZ, Kazungu M, Bauni E, et al. The validation of a three-stage screening methodology for detecting active convulsive epilepsy in population-based studies in health and demographic surveillance systems. Emerg Themes Epidemiol. 2012. https://doi.org/10.1186/1742-7622-9-8. Giuliano L, Cicero CE, Crespo Gómez EB, Padilla S, Bruno E, Camargo M, et al. A screening questionnaire for convulsive seizures: A three-stage field-validation in rural Bolivia. Romigi A, editor. PLOS ONE. 2017; doi: https://doi.org/10.1371/journal.pone.0173945. Patterson V. Telemedicine for epilepsy support in resource-poor settings. Front Public Health. 2014. https://doi.org/10.3389/fpubh.2014.00120. Traore MO, Sarr MD, Badji A, Bissan Y, Diawara L, Doumbia K, et al. Proof-of-principle of onchocerciasis elimination with ivermectin treatment in endemic foci in Africa: final results of a study in Mali and Senegal. PLoS Negl Trop Dis. 2012. https://doi.org/10.1371/journal.pntd.0001825. World Health Organization. WHO Mental Health Gap Action Programme. [Accessed 12 Dec 2017]. Available from: http://www.who.int/mental_health/mhgap/en/. Nelson SFJ, Robert C. Intervention for reducing epilepsy-associated stigma. Epilepsy Behav. 2018; Accessed 6 Oct 2018]; Available from: https://linkinghub.elsevier.com/retrieve/pii/S1525505018307157. Colebunders R, Mandro M, Mukendi D, Dolo H, Suykerbuyk P, Van Oijen M. Ivermectin treatment in patients with onchocerciasis-associated epilepsy: protocol of a randomized clinical trial. JMIR Res Protoc. 2017. https://doi.org/10.2196/resprot.7186. Anguzu R, Akun PR, Ogwang R, Shour AR, Sekibira R, Ningwa A, et al. Setting up a clinical trial for a novel disease: a case study of the doxycycline for the treatment of nodding syndrome trial – challenges, enablers and lessons learned. Glob Health Action. 2018. https://doi.org/10.1080/16549716.2018.1431362.